The new luxury vessel known as Ylang begins her journey from a pier on the small island Cat Hai near the city of Hai Phong (approx. a 1.5-hour drive from Hanoi). It is the only dedicated 2-night luxury vessel in this area. After the successful launch of Ginger in June 2018, Heritage Line’s Ylang will be the new addition in 2019 to the collection of top luxury vessels cruising the unspoiled bay of Lan Ha (Lan Ha Bay is a quiet extension of the famous Halong Bay). A journey on Ylang offers a fantastic medley of exclusive on- and off-shore experience. 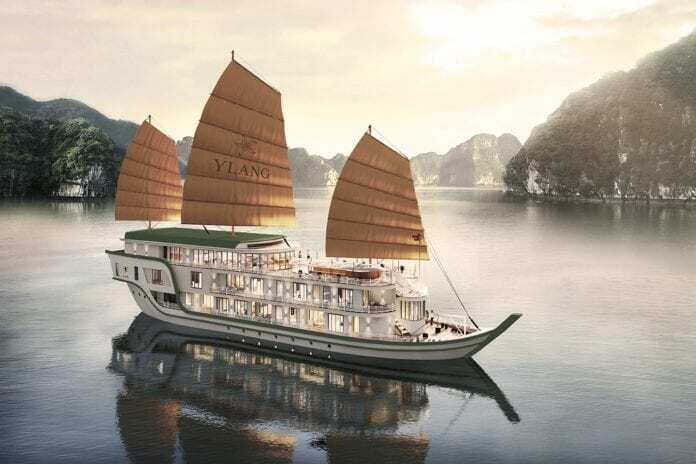 This 10-Suite “Sensuous Belle” will have her maiden voyage on the August 17, 2019 sailing on a very distinctive 3-days/2-nights journey named “Senses of Lan Ha”. The itinerary of Ylang includes two overnights in the serene Lan Ha Bay. Unique and captivating excursions from cycling to leisure hiking on Cat Ba island and an exploration of a remote Lan Ha Bay fishing village are the highlights during the stay. All activities are paired with a nicely balanced wellness leitmotif aboard the vessel including a half day for guests “at their own pace” to choose from various spa offers, yoga, swimming or kayaking.